This is an actual page from this brides wedding album. Shown here of course are the brides family and grooms family portraits. Brides often include several photos of their family formals, but we try to stress that less is more. 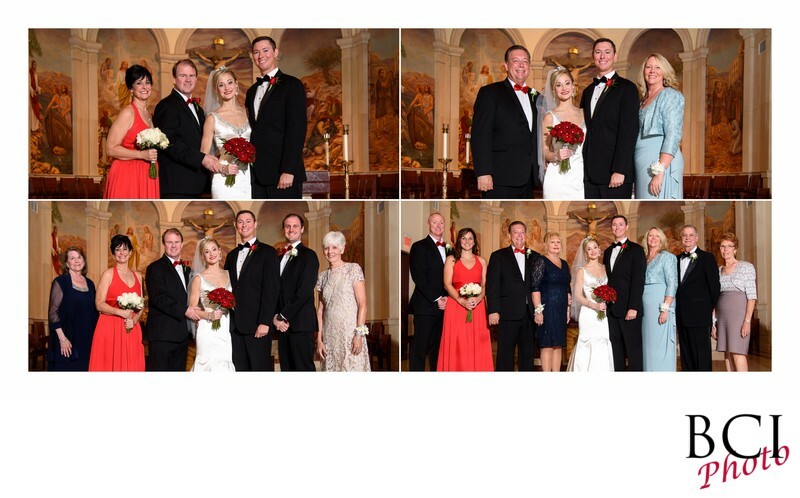 The more pictures displayed the more cluttered the appearance, and of course the smaller each wedding image becomes. We take capturing your wedding party and familyformals as one of our highest duties.After all, there are only a few times in life when all these important people typically gather.And THIS is the happy one. Each family is different, as is each bridal party.So, we tend to dedicate the space in the bridal album accordingly as you might expect.However, when we shoot the formals, we do it the same way each and every week, thereby making what for some is a long drawn out ordeal, is now just a 15 minute segment between the ceremony and the romantics! To us, your wedding album should flow and tell the story of your day.As such, the order of events will follow the same order in the book as it occurred throughout your day.